The aim is to enhance the communication between a member of staff and someone hard of hearing visiting the building. This can be done by either installing a fixed loop underneath the counter top with a small microphone on the staff side which will pick up the speech and relay it to the member of the public who needs to switch their hearing aid to the “T” position. Considerations: This can only provide satisfactory results on a one to one basis. 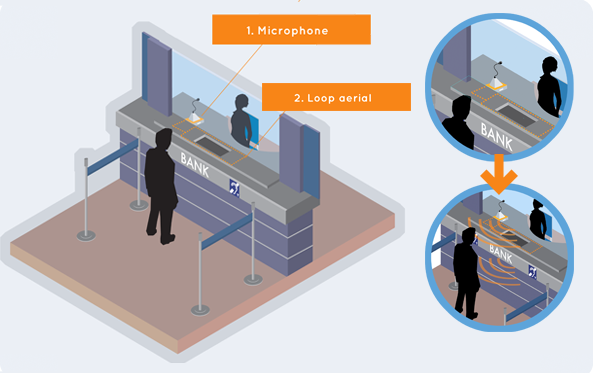 Trying to cover one reception counter with say three receptionist positions with a single loop simply can’t work. Simultaneous conversations could be picked up by the microphone and multiple microphones would make this problem worse. This would result in little benefit to the user and probably be less beneficial than keeping the hearing aid switched to its normal position. Another consideration is to use a portable loop at a reception, which can be brought out as required, or left in situ on the counter top. 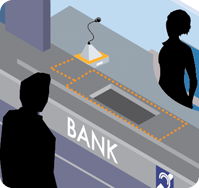 In instances where the staff member may be hard of hearing the loop may be extended onto the staff side of the counter and a second microphone employed on the system to pickup the voice of the member of public. Meeting rooms vary in size and layout considerably and as such, there is potential for ineffective systems to be installed if they are not carefully considered. Broadly they fall into two categories, small ones without any other audio enhancement, and larger ones with. In the case of the latter the room will have a sound system of some sort to assist everyone with hearing what is being said. As this will utilise multiple microphones, it makes perfect sense to utilise this system as the sound source or front end for the induction loop. 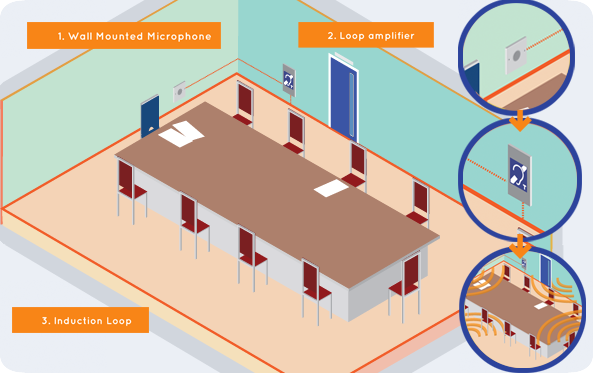 Microphones deployed around the room feed the loudspeaker system and then provide the signal to drive the induction loop. This style of system generally works very well as there are multiple microphones within close proximity to those speaking. On smaller to medium sized rooms where there is no requirement for a sound system, the loop system requires one or more dedicated microphones. These need to be located as close as possible to the main area of use within the room which creates installation issues. One solution is to use a wall or ceiling mounted plate microphone which picks up sounds within the room. However if the room has a high ceiling or reflective surfaces, this creates a problem in that the quality of the sound being picked up is poor and of little benefit for anyone listening on the loop. Modern rooms with false grid ceilings at approximately 2.5m height allow reasonable results to be obtained with a microphone placed centrally over a central table, or in the case of a theatre style of layout, over the front speaking position. 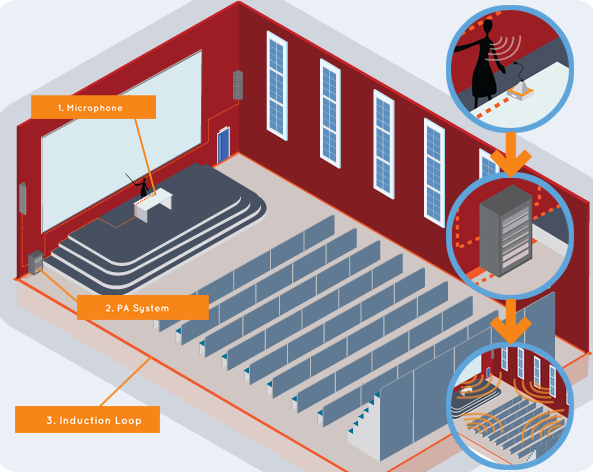 Most lecture theatres would be expected to have some form of sound enhancement system, and this would form the perfect source for a loop in much the same way as the larger meeting room would. It is possible that such a system would use one or more wireless radio microphones which would maintain a constant distance between the speaker’s mouth and the microphone, thereby providing consistent high quality results. Again, consistent with the above, virtually all churches have a sound reinforcement system with multiple microphones including radio types. 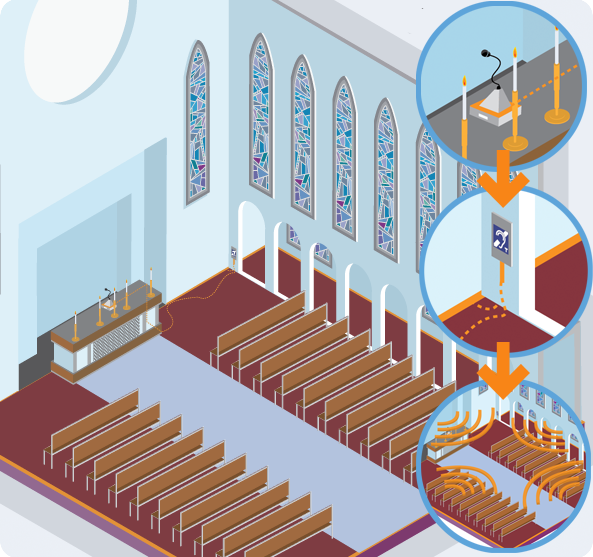 The church loop system is now virtually standard in all denominations and buildings, and provides excellent results when used in this format, particularly with an aging congregation who proportionately have a higher than average number of hearing aid users.